It took longer than expected, but Samsung is expanding its product line to include external solid-state drives with a new line of Portable SSD T1 products. The lightweight drives have capacities of up to 1TB and are small enough to fit in your pocket. They’re significantly more expensive than magnetic hard drives, though, which come in capacities of up to 6TB. 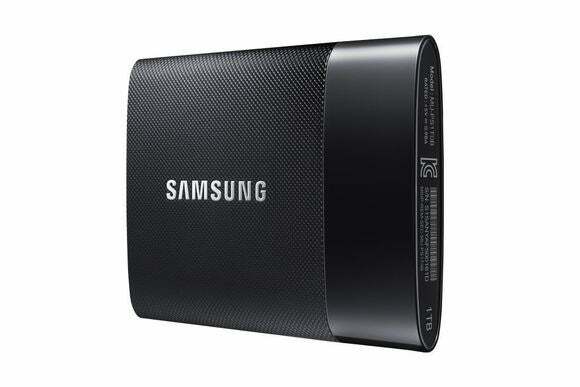 Samsung’s 250GB external SSD is priced at $179.99, a 500GB drive is $299.99, and a 1TB drive is $599.99. By comparison, a 1TB magnetic drive can be acquired for under $100. External storage is mostly used for data backup. But demand for external drives is growing as users download and store more multimedia and programs. Storage is also limited in Chromebooks and lightweight Windows laptops and hybrids, so users have to revert to external storage to preserve files. But Samsung’s portable SSDs will be faster and more power-efficient than external hard drives, said Richard Leonarz, senior marketing manager. SSDs are faster at reading and writing data than hard drives. SSDs also don’t have spinning disks, which are prevalent in hard drives and can draw a lot of power when reading and writing data. The Portable SSD T1 drives will connect to a PC’s USB 3.0 port. The SSDs have sequential read and write speeds of 450MB per second, random read speeds of 8,000 IOPS (input/output per second) and random write speeds of 21,000 IOPS. Samsung already makes internal SSDs, which are widely used in laptops and have up to 3.2GB in storage capacity. The external SSDs are based on the same advanced 3D V-NAND technology that gives its internal SSDs speed and durability. The 3D V-NAND SSDs have storage units stacked on top of each other, much like a skyscraper, which is a more power-efficient and speedy structure compared to the planar structure used in most SSDs today. Samsung is now taking on the likes of Seagate, Western Digital and Toshiba, which largely sell external hard drives and hybrid SSD-hard drive products.